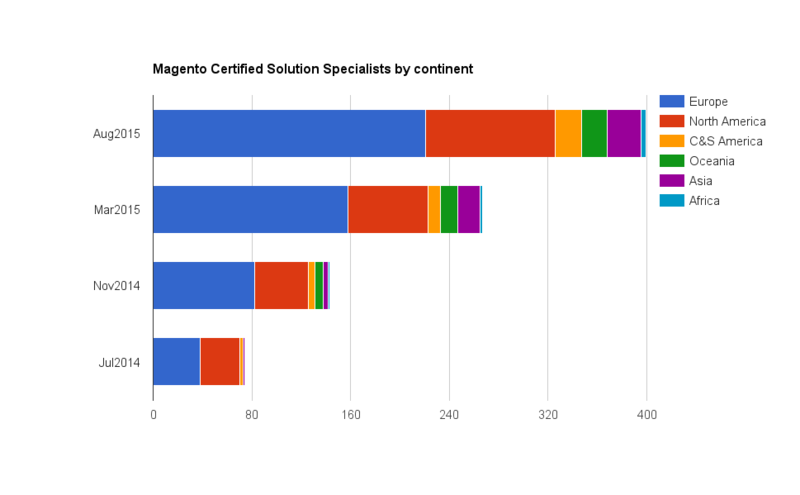 The latest figures on the Magento Certified Solution Specialist certification are in. We are now over 15 months into Magento’s only business-oriented certification program, and I’ve kept track of what’s happening in the world of us Solution Specialists, light-crunching the figures officially available via Magento’s certification directory. This is the fourth quarterly State of Magento Solution Specialist Certification report by Inchoo – so make sure to check some of the trends. United States have picked up the pace since the March 2015 report and they show higher growth figures that most of the EU countries, but Europe still has a firm global lead over North America. Central and South America are currently the fastest growing continent(s) with 110% growth, but the overall, global growth has slowed down significantly – there were 50% new certificates obtained globally since March 2015 as opposed to 86% new ones in a previously observed period (November 2014 to March 2015). This may very well be due to the fact that Magento 2 is approaching and some companies and individuals are thinking twice whether to invest in a current certificate or wait for the M2 one. 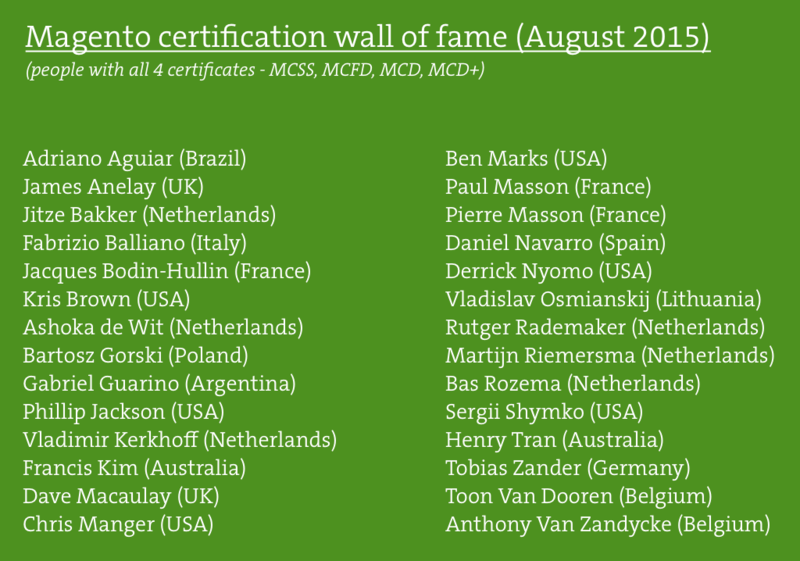 At the moment of drafting this report, the Magento community (and more importantly, Magento merchants) can count on a nice group of 400 certified solution specialists (well, those that have been publicly listed to be more accurate, and I added a couple I know of myself that don’t have public profiles accessible) coming from the total of 43 countries. But good news is – you don’t have to visit all these countries looking for the right match – just look around for the nearest Meet Magento – many of these solution specialists will most likely flock to such an event. USA has reached a nice round figure of 100 certificates and retains a huge lead in front of EU countries, and it has also marked higher growth than many of its European counterparts. It has also improved on the global share which has grown from 23% in March 2015 report to 25% at the moment (100/400). United Kingdom is also growing fast and it now hold a firm second place with Netherlands, Germany and Sweden close behind. 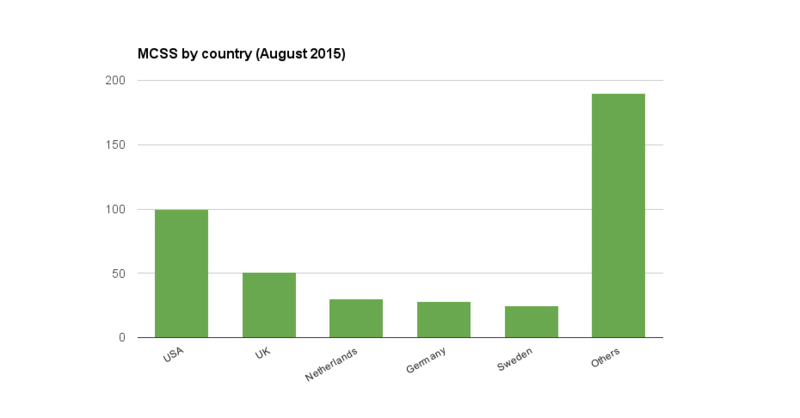 As for the cities across the globe where you can find a fellow MCSS, Stockholm – one of the Venices of the North – takes over the lead from our hometown of Osijek with 17 total certificates, thanks largely to Vaimo team. London joins Osijek with 15, and it’s so nice to see how some of these “smaller” cities where Magento Solution Partners are based, are still topping the charts. Groningen (NL) is where MediaCT and Guapa Media are headquartered, while Springfield (US) has a bunch of Classy Llamas calling it home. New cities about to crash this USA-EU party are Mexico City with 8 and Ahmedabad (India) with 6 – so they deserve to be mentioned, as they might just enter the Top 5 soon. Vaimo continues to grow rapidly, so this time around they have the total of 30 MCSS badges spread around several European offices and it looks like they’re not going to give away their lead any time soon. We’re happy to welcome our Latvian friends of Scandiweb to the mix – this is their first Top 5 appearance, so congratulations! And wouldn’t you believe it, they’re not even official Magento partners. It’s a great thing to be a part of a huge Magento community, so I’m thrilled to be able to continue paying special tributes to those individuals who have taken the time out of their busy schedules to master Magento inside out and collect all four available Magento certification badges (MCD, MCD+, MCFD and MCSS). Last time there were 18, now we have 28 such stars on the list. If you know of anyone who should also be included but isn’t (this would most likely be due to their profiles not being searchable in the directory), let me know and I’ll make sure to pin them to this wall of fame. What will happen when Magento 2 comes along? Well, not much – at least not immediately and not when it comes to official certification – the new exams will be ready only after we’ve all had sufficient time (people are talking about some 6 months after General Availability that is set for mid November) to take Magento 2 for a test drive (we won’t call it that in front of the merchants, of course). In the meantime, there’s one official Magento 2 development training available from Magento – Fundamentals of Magento 2 Development – better start preparing. So, what are your plans for MCSS certification? Do you plan to invest more in getting yourself (or your team) certified with the current program or will you focus your attention mostly on Magento 2 and everything that comes with it? There’s also a possibility that not all people who got certified made their profiles publicly available and searchable (I know of several such cases), so the actual number of certified solution specialists is probably a bit higher. Appreciate your effort on keeping track of the Magento Solution Specialist Certification figures !